There seems to be only a few anime that can move individuals to tears in any given year; however, Violet Evergarden, in particular, is so powerful and moving that I daresay that it rivals the emotional weight of anything I have ever seen. Admittedly it is very difficult for me to remove a bias that simply cannot be ignored given the material this series covers. However, I do not think it is unreasonable to still call this work a masterpiece. Simply put, this show is one of the best-animated anime around and even if audiences cannot connect with the rest, it is impossible to deny the fact this fact. In addition, the score is something of class and construction that does not carry itself like it is part of an anime, but rather an emotional classical album. Where fans may diverge, however, is their interpretation of the writing in Violet Evergarden. There is a soft, subtle development within the titular character that leaves a noticeable faction of viewers bored and impatient as the episodes move forward. Without getting into spoilers or using minute details, where I found the series to be so effective is that Violet’s character arc is not one of convention. Nothing is noticeably proclaimed or held out to the audience, and throughout this journey, Violet makes her developments (and, more importantly, her own struggles along the way) that lead her into a maturation. This maturation takes a shell of a person that is tearing apart from trauma and turns her into a blossoming writer with words that can reach people. As Violet learns to reach people with her writing, she works with numerous clients who are just as traumatized and conflicted about their lives and relationships in a very bleak post-war setting. Violet Evergarden is not the anime of 2018. This series is a masterpiece that shines bright among the very best of the best. While it certainly does take a viewing of certain patience to fully take it all in, there are so many facets of the series that are moving and beautiful in ways that are difficult to completely explain. Perhaps it might not be for some in this very moment, but there are so many different walks of life that are touched upon that at some point for many this anime can receive the just title of the anime of a generation. I’m thoroughly convinced I will never see another series as moving and impactful to my life as Violet Evergarden was. TL;DR: Violet Evergarden is an artistic masterpiece that excels in unparalleled animation, music, and writing. While the impression of the series rests entirely on how much someone can “buy in” tothe gravity of the world and characters, those who are open to this anime are bound to be moved by they find. In the beginning, Violet Evergarden struggles to convey emotion on paper. I share the same problem in expressing what this show meant to me. Are the tales of individuals looking for Violet’s help what nearly brought me to tears every episode? Was it the compassion I felt as she attempted to help others in need? Maybe I couldn’t help but marvel at Kyoto Animation’s achievement in art, animation, writing, sound, and direction. I think it might be all of those things. Most of this series focuses on Violet writing letters for a new client every week. Some of these people are more easy to empathize with than others, but you can always root for Violet to help them out in the end. The key here is that she needs to understand who she’s helping before she can do anything for them. This is certainly not a new formula in storytelling, but the show executes it in a way that you learn along with her. As a viewer, you know the obvious: a client wants to express their feelings to someone they love. However, there’s always something to which you’re not privy to. Towards the end each episode, you learn the true nature of the situation — but Violet already knows. That is, she doesn’t need to know. Violet grasps what’s important for the sake of writing a letter, despite not actually knowing why the person would feel that way. Each job brings her a little closer to understanding her feelings; and the moment when she nails the client’s request, you can’t help but feel tremendously proud of her. I think it’s these moments that form the foundation of Violet Evergarden. I’d be remiss if I didn’t dedicate much of this review to KyoAni’s art style and what it means to me. I first became a fan with The Melancholy of Haruhi Suzumiya and Full Metal Panic. I always loved their clean and friendly animation style, but they really struck a chord with Hyouka. It was an enormous leap in quality on every level. The way characters talked, how they acted towards one another, the camera direction that kept every scene fresh — it was all so good and so inspiring. As a character artist, I couldn’t help but admire every little detail they put into these individuals. I knew that I would have to look out for KyoAni in the future. I could go on about how much I loved the hilarious Nichijou or phenomenally introspective Sound Euphonium. They just keep pushing the limits of what I expect out of anime made for television. We’ve recently been blessed with some very high production values in anime thanks to Netflix’s exclusive pockets, and KyoAni spared no expense with Violet Evergarden. When I watch this series, I can’t help but think of the people involved. I can’t stop myself from examining the way their artists draw eyes to make pupils shine like gems and appear rounder than any human eye ever could. The dozens of frames that go into a simple hand gesture speak louder to me than any words ever could. I’m both impressed and jealous of what Kyoto has achieved with Violet Evergarden. TL;DR: Incredibly produced on every level, you will find yourself longing to see Violet smile. That moment and the episode that follows, is the pinnacle of visual storytelling. 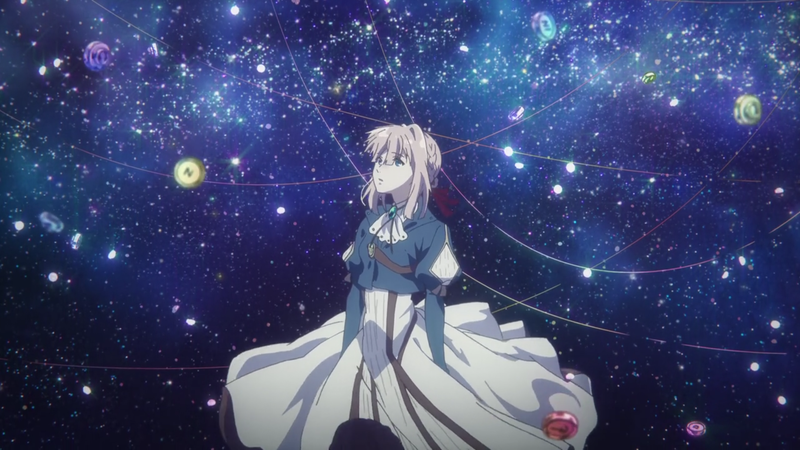 From the moment its first trailer stunned audiences with incredibly detailed visuals, Violet Evergarden became one of the most anticipated anime in recent memory. The animation lived up to the hype, and few people would argue against it being the most well-animated series of 2018. However, the production team’s attention to detail did not end with the illustrations. Through the lens of its titular character, Violet Evergarden explores the meaning of love and the emotional impact of language. Violet’s childhood was spent mostly as a ‘tool’ that the army utilized in warfare. Her connection to human emotion was limited by her minimal interaction with others and the twisted nature of prolonged violence, but her journey following the war is one of self-discovery and growth. As an Auto Memories Doll whose job it is to convey clients’ true emotions through letters, Violet comes to understand her feelings through her many extended interactions with different people attempting to deal with their own emotional conflicts. To merely call Violet Evergarden a coming-of-age story would do it a disservice; throughout Violet’s journey, the word ‘love’ and what it means to each person she meets is both grand in scale and at the same time extremely intimate. Although each person’s story helps Violet develop her own human empathy, the individual stories themselves stand on their own as moving testaments to humanity. Violet Evergarden’s all-out animation and beautiful soundtrack help to accentuate the show’s emotional moments and make even everyday scenes feel alive in a way that few other series manage. The soundtrack is by far my favorite in recent years. Composer Evan Call’s sweeping orchestral arrangements are extremely well crafted, but the reason that they left such a lasting impression on me is their emotional ties with moments in the series both brief and climactic. The aesthetic and narrative detail of each story creates a sense of intimacy with the characters and world of the series that has remained strong with me in the year since my first viewing and will likely continue to for a very long time. TL;DR: Violet Evergarden is a technically proficient show that goes beyond the sum of its parts to create an intimately emotional story about love and humanity. I imagine that we will continue talking about this one for years to come. There’s something quite special about coming-of-age shows that I can’t help but love, and Violet Evergarden is one of the most unique I’ve seen. Unlike so many characters in anime, Violet grows in a way that feels meaningful: at the beginning, Violet doesn’t know what people mean when they communicate the thoughts and beliefs that color our everyday lives. She fails to empathize and express emotions; throughout the work we see her learn emotions from which she’s always closed herself off. At the beginning of the show, Violet isn’t her own person, dependent on someone else to dictate her life and give it purpose. Thanks to hardship and loss however, she’s forced to mature, to become her own person, all of this done in a way that’s incredibly impactful. All of this makes for an experience that is truly special and one of the most heartfelt I’ve seen in a long time – almost nothing I’ve seen speaks to this core element we feel in our lives, and that makes for a really magical show. That being said, what I’m going to remember from my experience watching Violet Evergarden isn’t the coming-of-age, isn’t the romance, isn’t the animation, and isn’t the characters. While those elements are great, what sets Violet Evergarden so much apart from other works I’ve seen is its emphasis on meaningful communication. While this might not seem important on first glance, it’s something that dictates so much about our lives but is rarely a focal point in media, to the point where we have entire genres dedicated to the sole act of avoiding effective communication (romantic comedy /s). We live in an age of data – there is information everywhere, to the point in which knowledge can be a hindrance in our lives, something that couldn’t be said years ago. Violet Evergarden, a show all about communication then, somehow manages to be one of the most respectful shows I’ve seen regarding communication which is rare to see. It doesn’t treat your time like something disposable; it fills your experience with substantial, engaging content, has a meaningful conversation with you, the viewer. It emphasizes this with the content in the discussion, displaying how meaningful and important information can shape so much. It harkens back to when frivolous contact wasn’t possible, and by doing this, places importance on the substantial, necessary discussions in our life. What I’m taking away from Violet Evergarden is to have more meaningful conversation as shallow, skin-deep interactions really mean nothing in the face of actual, heartfelt communication. I have my gripes of course. I think that the show has an incredibly dry cast, and while they get development, very few characters became more interesting to me. Add to this Violet’s slow start and generic setting made it seem like the kind of show I wouldn’t really care for even if well done. Partially because of these elements and partially because of circumstance (thanks Netflix and school), when the show came out, I didn’t even bother watching it – I dropped the show after the first episode. Now, looking back on this, I just have to wonder: was I so burnt out that I couldn’t appreciate a show like this? While every episode might not have been necessary, all of them were incredibly well done and very engaging. The show flips a switch halfway through and becomes a roller coaster of emotions. I’m an absolute crybaby in real life and when watching anime so keep this in mind, but I cried in four separate episodes because of how touching and moving this show is, and that to me alone is a mark of quality. It takes a special show to move someone that much, and Violet Evergarden, while probably not one of my favorite shows due to my tastes, is at least one of the most impactful and meaningful I’ve seen. Definitely a recommendation from me if you’re interested. TL;DR: Violet Evergarden is a wonderful drama that’s done exceedingly well thanks to great production values throughout. Where the series shines is executing a fantastic coming-of-age story and conveying its ideas, themes, and thoughts in a meaningful manner, leaving the viewer thinking about the show long after they finish watching. I’ll make this clear up front: I love Kyoto Animation. From Sound! Euphonium to Clannad to Free! and everything in between, no anime studio more consistently moves, entertains, and astounds me as they do. Naturally, my hype for Violet Evergarden was through the roof. Violet Evergarden is a love letter to language, to both the power and limitations of language to fully express one’s emotions. Framing this exploration around Violet, a character who knows language only as a tool for militaristic communication highlights how language begets a stronger relationship to and appreciation of the world. “I want to know what ‘I love you means,’” Violet pleads; by the time the series concludes, we learn that love is in a mother eternalizing herself for her daughter, in a soldier’s last words, in an estranged sister’s eternal bond with her brother, and in a child soldier turned Auto Memories Doll, trying to figure out where she belongs. Each letter Violet writes is a symbol of love, a symbol of language’s power to connect and express the inexpressible. As Violet writes, she comes to terms with her grief, with her inability to understand love, and gradually her world opens up, splendour and light shining in. As a writer myself, the love Violet Evergarden shows language and how language allows us to express ourselves and appreciate the world moved me in ways few shows ever have. Violet’s world is one of KyoAni’s finest and most intricately crafted. The colours, the details, the lighting, the delicate movements, all serve to make Violet Evergarden feel real and believable. We are drawn into Violet’s world because each character emotes with such stunning subtlety that we can’t help but think they’re real, such believable movements that we can’t help but be entranced. Kyoto Animation’s shows are always visually stunning, each in their own way, but Violet Evergarden distinguishes itself through the sheer attention to detail and wholeness of its vision. All this to say, I loved Violet Evergarden. Though it is a slow burn and its semi-episodic nature may turn some potential viewers away, its emotional payoffs are satisfying enough to make it worthy of your time. If nothing else, watching Violet learn to write, learn to express herself, might encourage you to open a Word document and begin writing yourself. After all, within that blank page is a world of expression, a world of possibilities and promises. TL;DR: How fitting that words cannot adequately express my love for Violet Evergarden. From its outstanding visuals to its intricate character development to its fascination with and appreciation of writing, this is an anime not to miss.